I really, really hope the russian 636s can also launch klubs, since the lada is effed up in construction delays. Torpedoes will never be as effective against carriers as missiles. KomissarBojanchev wrote: I really, really hope the russian 636s can also launch klubs, since the lada is effed up in construction delays. They can... 8 maximum I believe. A P-3 or seahawk or sonobouy will detect all russian submarines far before they reach torpedo launch range. The situation is even worse for US submarines, especially when their missiles are also anemic. Besides torpedo nuclear warheads aren't as effective as missiles's. KomissarBojanchev wrote: A P-3 or seahawk or sonobouy will detect all russian submarines far before they reach torpedo launch range. The situation is even worse for US submarines, especially when their missiles are also anemic. No, they won't... They only have so many, and they aren't constantly launched. In fact, no US ASW aircraft supports them anymore (I believe)... - Same thing with the Seahawk, it won't always be in the air. Even if it is, there is no guarantee of detection. - They use dipping sonar, which isn't the best nor most advanced system available. - They'd have a heck of trouble going up against an improved Kilo, Lada, or even the regular Kilo! - The idea was launching missile first, and leaving the torpedoes to "clean up duty" etc. Never said they wouldn't use missiles, just that they have more defense against them. - Not like it is effective..
Not true. Modern torps that detonate beneath a ships keel are capable of gutting a supercarrier with a SINGLE strike. The mass of water surrounding the warhead acts like a bottle and focuses the blast towards the point of least resistance, ie the ships hull. The blast is directed upwards and through the guts of the vessel rather than in all directions as in a detonation in air. Given that many of the vital stores are located below the waterline (ammo, jet fuel etc) such damage can be catastrophic. Check out some of the public domain footage of torp test against derelict vessels. A destroyer-sized ship is literally chopped in half by the blast, whereas a missile with comparable warhead yield might blast a big chunk of superstructure to smoking ruin, but the vessel is unlikely to sink unless damage control parties lose control of the resulting fires. The target was the decommissioned HMAS Torrens, a 2700 ton destroyer. The target was the decommissioned USNS Kilauea, a 12,000 ton (empty) ammunition tender. Both sunk by a Mark 48 torp with a 295 kg warhead, but Russian Type 53 family would be equally as destructive. Imagine such a hit directly beneath one of the reactors of a Nimitz class carrier. Even if the ship didn't sink she would need to be abandoned due to reactor breach. A single Type 65 torpedo with 450kg conventional warhead can sink an aircraft carrier. It can also be armed with 20kt nuclear warhead. coolieno99 wrote: A single Type 65 torpedo with 450kg conventional warhead can sink an aircraft carrier. It can also be armed with 20kt nuclear warhead. Yep, I'd be willing to say that a single Type 65 has a better chance of completely destroying a ship than a subsonic AShM. Given the development of drone technology, I wonder how long it will be until autonomous kamikaze submersible drones are developed. I can imagine a drone mini-sub/torpedo hybrid with an RTG & batteries for essential electronics and low speed ultra-quiet patrol (intermittent operation depending on battery capacity) and literally years of endurance, and high-energy liquid-fuelled turbine propulsion (hypergolics?) for use in battle conditions to generate high speeds for attack and out maneuvering active defense. Making holes in the bottom of ships has always been an effective way of sinking them. Anti ship missiles let fire into the top of them, which is also very effective. What if those subs are sent to ambush those carriers that are on their way to a deployment and are moving at 30+ knots and have not deployed their anti sub aircraft? A 650mm torpedo with a 100km range with a 20KT warhead able to wipe out an entire battle group including any sub within 16km is not as effective as a missile. Very close... actually it is just a standard HE charge that like any HE charge creates an enormous amount of gas very rapidly. When detonated directly below a ship the HE charge creates and enormous air bubble, which as it rises tries to lift the hull of the vessel. As you can see on any dry dock a ship or sub needs lots of supports spread equally along its length. If you were to try to pick it up in one place... whether by crane or HE bubble from underneath, the section being lifted would rise but the weight of the rest of the vessel would hold each end down which would result in a vessel with a broken back ripped in half which sinks rapidly. This works only on surfaced vessels... a sub under water isn't lifted by a large air bubble underneath it because the water above the sub pushes it down, so the air bubble will flow around the sub and up to the surface... some of the explosion might push in some of the hull but wont break the vessels back like a ship on the surface.... many western anti sub torpedos for this reason use a shaped charge to penetrate the outer layer to the inner layer in the hope that water pressure will do the rest. I guess you're right, but still, what torpedo has 600km range? In order to launch torpedos you need to be in a favorable position to the target. Unfortunately todays submarines cannot go more than 10kn/h near the battlegroup without being detected, so in effect it can't outrun and reposition itself if its behind the carrier. BTW whats so special about wake homing torpedos? Why can't you just throw around lots of soap bubbles all around surface as a decoy against them? KomissarBojanchev wrote: I guess you're right, but still, what torpedo has 600km range? In order to launch torpedos you need to be in a favorable position to the target. Unfortunately todays submarines cannot go more than 10kn/h near the battlegroup without being detected, so in effect it can't outrun and reposition itself if its behind the carrier. None, but that isn't the point... The idea is that AShM's and torpedoes could be used in tandem to create an almost unstoppable offensive. As I've stated many times, Western ships have less defense against torpedoes than they do AShM's. I guess you're right, but still, what torpedo has 600km range? But you are right in that no torpedo is perfect just like all missiles are not perfect or imperfect. In order to launch torpedos you need to be in a favorable position to the target. Unfortunately todays submarines cannot go more than 10kn/h near the battlegroup without being detected, so in effect it can't outrun and reposition itself if its behind the carrier. The Soviets planned for Torpedo attacks to take place after the first barrage of anti ship missiles. taking advantage of the Chaos created by the first wave the SSNs slip in close to launch their torpedoes which would start arriving about the same time as the second wave of anti ship missiles. The result is some ships hit by the first anti ship missiles can be sunk by the follow up torpedoes, while ships manouving to avoid the anti ship missiles can make themselves vulnerable to the Torpedoes... any ships hit by the torpedoes will become very vulnerable to the second wave of Anti Ship Missiles. Don't think of one or the other... they don't replace each other, they compliment each other. Defense Ministry spokesperson announced that diesel-electric submarine Rostov-on-Don will join the Russian Navy by the end of 2014. MOSCOW, November 14 (Sputnik) – Russia's new Varshavyanka-class Rostov-on-Don submarine will be handed over to the Russian Navy by the end of the year, a Defense Ministry spokesperson said Friday. "The newest diesel-electric submarine Rostov-on-Don will complete trials and be in service by the end of 2014," said Igor Dygalo, an official representative of the Defense Ministry press and information service. It is the second Project 636.3 Varshavyanka submarine (NATO reporting name Improved Kilo-class) out of six planned for the Black Sea Fleet by the end of 2016. The first of the submarines – Novorossiysk – entered service in September. 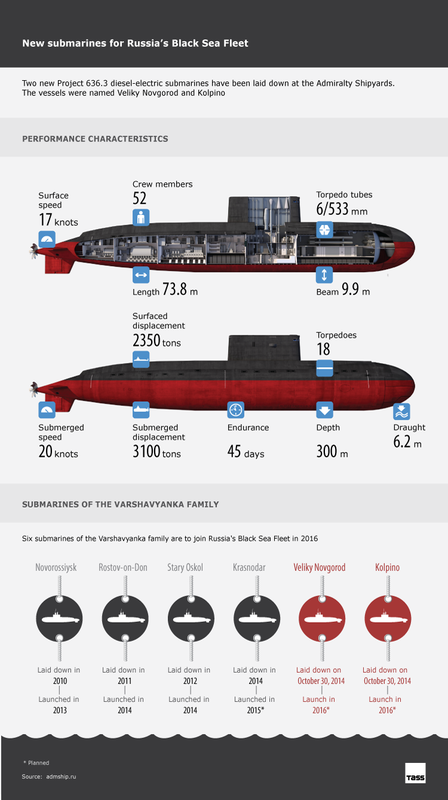 Varshavyanka-class diesel-electric subs feature advanced stealth technology, extended combat range and the ability to strike land, surface and underwater targets. They have been dubbed "black holes in the ocean" by the US Navy because they are virtually undetectable when submerged. The submarines are primarily intended for anti-ship and anti-submarine missions in relatively shallow waters. The Russian Black Sea Fleet has had no new submarines for decades and currently operates only one boat – the Kilo-class Alrosa, which joined the Navy in 1990. I'd like to see AIP with these new boats. Would be a major boost in underwater performance. "The Rostov-on-Don submarine should make a crossing to the Black Sea in the first half of 2015"
Does anyone have any good references to the differences between Project 636.0 and 636.3? kvs wrote: Does anyone have any good references to the differences between Project 636.0 and 636.3? Alrosa SSK. Is it in dock for repairs?